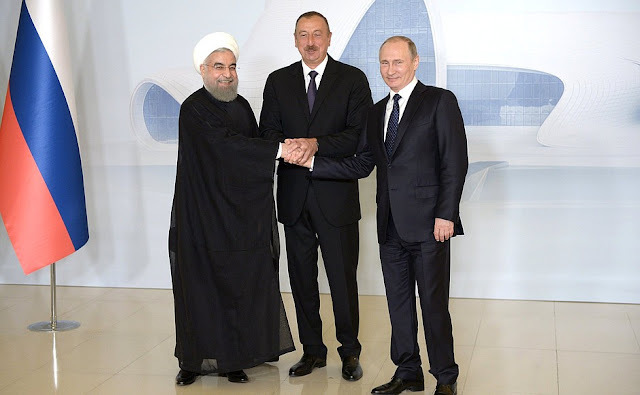 Iranian President Rouhani at trilateral meeting with President of Azerbaijan Ilham Aliyev (Center) and Russian President Vladimir Putin. 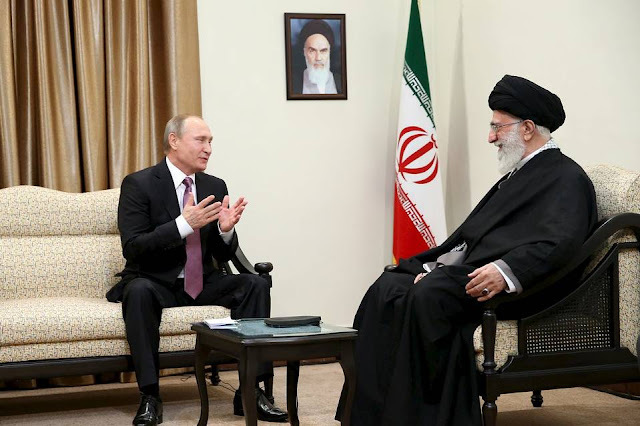 On a Wednesday 1 November 2017 the Russian President Vladimir Putin visit Tehran to meet with president Rouhani,supreme leader Ayatollah Khamenei and attending the trilateral meeting of Iran, Russia and Azerbaijan. Mr. Putin is seeking to cement the countries’partnership to resolve conflicts in Syria and counter balance U.S. that seeks to install new sanctions on Russia,Iran and other nations. Mr. Putin’s visit to the Iranian capital,is the first visit since in 2015 when visited Iran. This urgent meeting comes at a time of intensifying efforts to end the Syrian conflict. Iran’s president, Hassan Rouhani grabbed the opportunity to emphasize the importance of developing Iran-Russia cooperation, especially economic and trade ties, saying that Tehran welcomes the active participation of Russian investors and private sector in important infrastructural projects, including the industrial and energy-related ones, the development of railways, and the North-South corridor. The Iranian president also underlined that the Joint Comprehensive Plan of Action (JCPOA) is a multilateral agreement and its sustainability is very important for regional and international peace and stability. Russian President Vladimir Putin visit to Iran to attend a trilateral meeting and met Iranian Supreme leader Ayatollah Khamenei. Leader of the Islamic Revolution Ayatollah Seyyed Ali Khamenei also express excitement about experience of fruitful cooperation between Iran and Russia in Syrian conflicts saying that it proved the two countries can meet common goals in difficult situations. Iran’s Leader said the defeat of US coalition that was supporting terrorists in Syria is an undeniable reality, but they are still busy with conspiring and hatching a new plot. “Therefore, the complete resolution of the Syrian problem requires sustained close cooperation,” noted Ayatollah Khamenei. The leader of the Islamic Revolution stressed that the joint resistance of Iran and Russia against Takfiri terrorists, which are supported by some foreign countries, has had important results. “The good combination of Tehran and Moscow’s resistance against the sedition and corruption of the terrorists in Syria is very significant, and has turned Russia into an influential country in the region,” underlined the Iranian Leader. Iranian President Hassan Rouhani said that " Iran has reached good agreements in various sectors, including energy, peaceful nuclear technologies, transportation and transit. We should step up our efforts to implement these agreements and develop collaborations more,”. He also touched upon the role of Russia in consolidating the compliance of all parties with the nuclear deal. Rouhani also referred to the role of Iran and Russia in the fight against terrorism in Syria, stressing that the cooperation between Tehran and Moscow has had a great impact on the process of fighting terrorism in the region, and these collaborations and consultations play a very significant role in the final stages of the campaign. Referring to the Astana Process, Iran’s president said the multilateral, regional and international cooperation between Iran and Russia is of great significance in resolving the issues and crises. For his part, Russian President Vladimir Putin first thanked the Islamic Republic for hosting the trilateral meeting, saying that Iran is a neighbor and a strategic partner of Russia, and Moscow has many common interests in developing relations and partnerships with Tehran. Referring to the necessity of developing cooperation between Iran, Russia and Azerbaijan in the transportation, transit and north-south corridor projects, the Russian president said the trilateral meeting of the presidents of Iran, Russia and Azerbaijan could lead to the development of joint relations and collaborations in this sector. Putin further added that relations and cooperation between Tehran and Moscow have been growing in various sectors, including energy, economy, peaceful nuclear activities and rail and road transport. “Russian companies are interested in actively participating in Iran’s development projects, and there is no limit to the development of all-embracing relations with Iran. 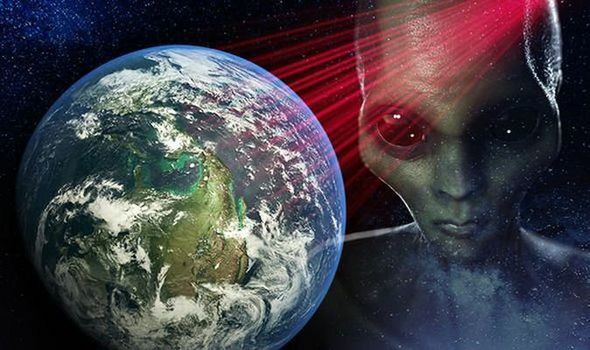 Russia welcomes the process,” added Putin. The Russian president also noted that based on statistics, trade between the two countries, especially in 2016, has grown significantly, and this trend must continue and accelerate. Elsewhere in his remarks, Putin described the JCPOA as a very good collective agreement in line with the global peace and stability. “The non-compliance of some countries with their international obligations is by no means acceptable. We do believe that unilateral disruption of the deal will not be acceptable on any pretext. Moreover, the nuclear agreement has nothing to do with Iran’s defence and missile programs,” stressed Putin. He also underpinned that the IAEA is the only reference for Iran’s adherence to the deal. Finally, the Russian president referred to the process of fighting terrorism in Syria and emphasized that the role of Russia, Iran and Turkey should be supported within the framework of Astana Talks. Rouhani said Tehran, Moscow and Baku’s trilateral relations play a very important role in regional affairs and expansion of cooperation in different areas. He welcomed President Putin’s proposal to expand cooperation in all fields stressing that it is needed to take advantage of the useful experience of recent years in regional issues and bilateral relations to consolidate and develop ties.